LIGHTER, FASTER, TOUGHER - The PowerAlley Lite-balls are the same size as regulation baseball but weigh only half as much and are designed to last longer for longer batting practice sessions. INNOVATIVE DESIGN - The dimpled design of these balls allow them to reach 60 miles per hour and travel more accurately than regular lite-balls. 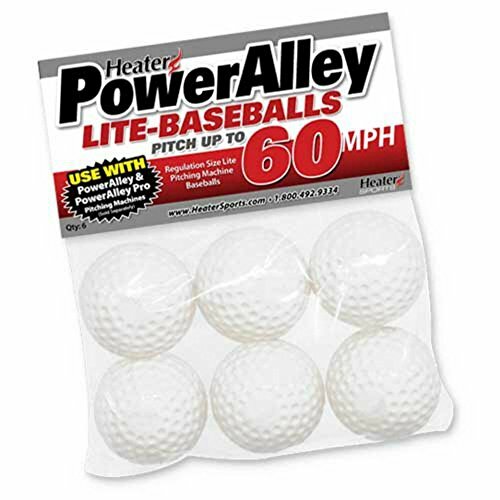 12-BALL POWERALLEY PACKAGE - The package includes 12 pitching machine lite-balls made for use with the PowerAlley and PowerAlley Pro pitching machines. WARRANTY AND FREE SHIPPING - Order now from Dazadi and get a 1-year manufacturer warranty and free shipping on your purchase. If you have any questions about this product by Heater Sports, contact us by completing and submitting the form below. If you are looking for a specif part number, please include it with your message.